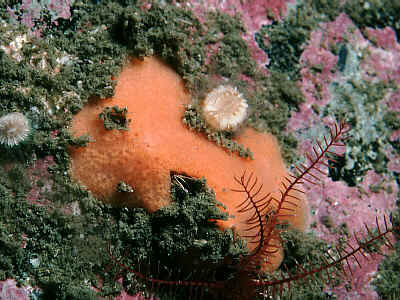 Description: This is a bright orange, cushion shaped sponge, usually 6-7 mm thick but it can be up to 30 mm. 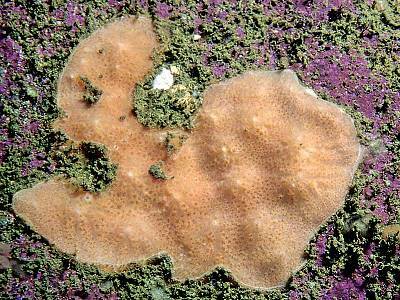 It is found in patches 2-5 cm across, with an irregular outline. The patches are rounded in cross section with steep sides. It turns black or brown when placed in alcohol. Habitat: This species can be found on lower infralittoral and upper circalittoral rock but is most frequently encountered on lower circalittoral bedrock on exposed open coasts. Distribution: Known recently from various sites on the west, north-east and south-east coasts of Ireland, also St Abbs, Coll and Lewis. 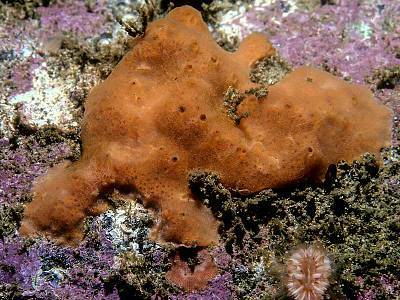 Similar Species: Superficially there might be confusion with Amphilectus fucorum but there are distinct spicule differences. The blackening of M. fimbriata in alcohol is rapid and striking, and this combined with a lack of slime in what is otherwise a typical Myxillid skeleton makes this species distinctive from other Myxillid species such as Myxilla rosacea and Myxilla incrustans. 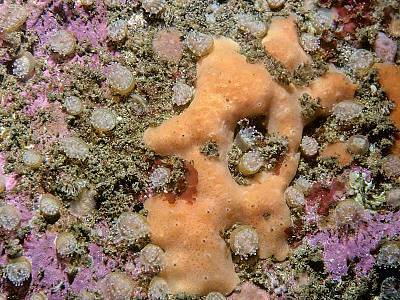 Bright orange cushion sponge, typically 6-7 mm thick. Found in patches 2-5 cm across. Picton, B.E. & Morrow, C.C. (2016). Myxilla fimbriata (Bowerbank, 1864). [In] Encyclopedia of Marine Life of Britain and Ireland.